THE MAGNETIC DRY ERASE BOARD IS A CONVENIENT SURFACE FOR KEEPING LISTS, NOTES AND MESSAGES. Never forget another event with this versatile dry-erase board. The dry erase surface makes writing and clean-up less of a chore. This durable board is easy to install. The anodized aluminum frame looks stylish in any decor. Dry erase message board captures all your to-do's and notes. Make your ideas and announcements the center of attention with this classically designed dry-erase board. This framed magnetic dry erase board is white with a sleek aluminum frame that complements practically any environment. The board comes with one dry-erase marker tray and the necessary mounting equipment. This VIVREAL dry erase board is ideal for home or office use. Whether you need to announce an upcoming staff meeting or jot down your grocery list, this board is a perfect solution. Best suited for personal and low-traffic environments, this board is the perfect size for home offices, break rooms, small meeting rooms and cubicles. This board is made of lacquered steel, which not only gives it a smooth writing surface, but also durable appeal. The sturdy surface is paired with an aluminum frame, ensuring this dry-erase board lasts for years. To get the most out of the board, its surface life can be extended with regular maintenance using our cleaning solutions. This board comes with a convenient organizing tray to keep your markers, erasers and cleaners within easy reach. Keep the area neat and presentable by storing supplies on the tray, instead of in random places. SMOOTH AND DURABLE SURFACE. VIVREALmagnetic dry erase board comes with smooth and durable surface, anti-scrap, easy dry-wipe and easily dry wipe with all dry-erase markers. This magnetic dry erase board a smooth, clean surface that you can use not only dry erase markers on, but also permanent markers and grease pens. DURABLE AND STURDY. Made from cutting-edge materials, the white board can last very long. The white board comes with anodized& scratch resistant aluminum frames and four ABS corner. Mounting hardware included.Thisdry erasewall size board will ensure a long lasting reliable product. TWO WAY INSTALL& VERSATILITY. This multifunctional dry erase board is easy to install and remove.Themagnetic dry erase boardcomes with 4 hooks so that it can be mounted horizontally in two ways. You can hang it on screws or "S" hooks or put it on a removable stand. 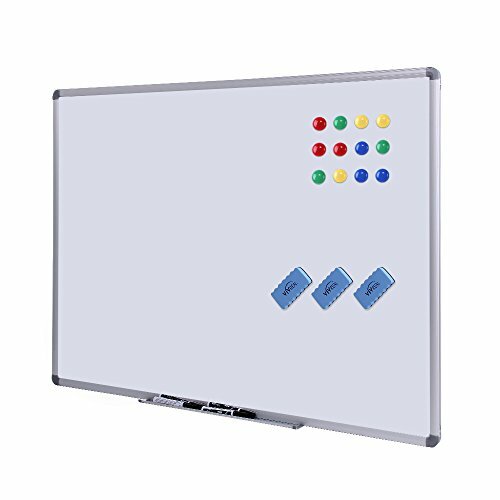 This dry erase board can be used to keep track of schedules, to make to do lists, improve your teaching quality, help your speech in office. You can even put a dry erase board up in the kids' room to help them remember their chores. ONE STOP SHOPPING gives you 1 dry erase board, 3 erasers, 4 markers and 12 magnets. It also comes with a marker tray. Without any need to waste time to buy other accessories, get this one to satisfy all of your needs! It can be hung on any wall and re-positioned in just minutes if you want to move it. SAFE SHIPPING & LONG-TERM WARRANTY: We have done stress test shows that specially designed packaging prevents 98% shipping damage to the magnetic board. Even though we are confident that our improved packages of the whiteboard can resist high level of impact force, there would be a few that will get broken due to transportation conditions. HOWEVER, don? ?t worry for it, we offer a Free Replacement Policy and 5-YEAR warranty, totally no risk order for you! View More In Presentation Boards. If you have any questions about this product by VIVREAL OFFICE, contact us by completing and submitting the form below. If you are looking for a specif part number, please include it with your message.